This should solve my future planning problem in my bullet journal. 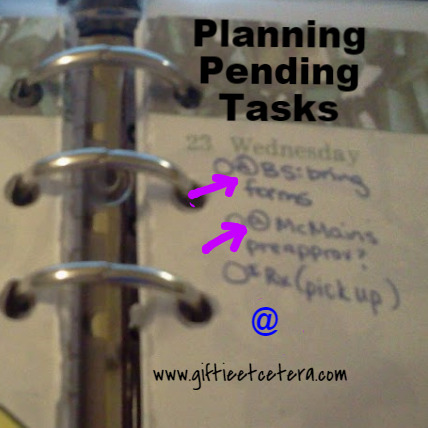 Of course, the page would be peppered with @s.
I have a "next week" dashboard, or how to call it... Its a clear flyleaf. I have this pending tasks on post it notes (maybe I wrote a mail on this date, she wrote me that, etc), and I also have here a "brain dump" post it for next week tasks... on my weekly review checklist I have an item: review the pending tasks. almost always are these solved for the weekend - than I can toss the post it, if not and it's deadline is coming, I write a task to my day: ask after x. if it is not so urgent the post it stays on the fly leaf. I put things I'm waiting for - like a check - on my monthly calendar in the Notes section. Or an order. Or results of a test. But things like you're talking about - I don't really know where I put those. Maybe I don't have too many. Hmmm - I'm going to have to think about that.